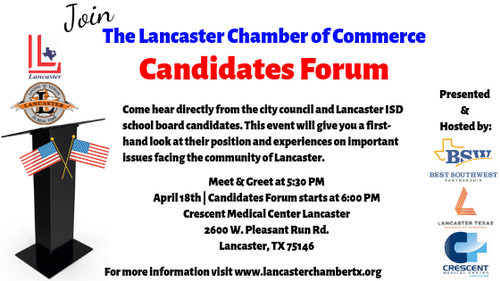 As part of the Lancaster Chamber of Commerce 2019 Legislative Program of work, the Chamber would like to invite voters to attend a Candidates Forum featuring candidates for the 2019 City of Lancaster City Council and the Lancaster ISD Board of Trustees. Each Candidate is invited to join and present their platform for the office they are seeking. This event will allow Lancaster citizens and local business to learn more about the candidates before early voting begins on April 22, 2019. Please use main hospital entrance. There are several buildings on the property. Event will be held in the 2600 building in the middle with the porte cochere.